Percentage of World Widebody Aircraft Backlog for Middle Eastern Airlines -AVITAS, Inc.
Middle East order backlog for widebody aircraft now totals about 700 aircraft. The order backlog in this region has risen rapidly from ten years ago and now represents about 30% of worldwide widebody aircraft orders. Of significance is the relationship between oil price and orders for widebody airplanes. As oil price increases, widebody orders increase for airlines in the Middle East as the region benefits from increased revenue from high oil prices. 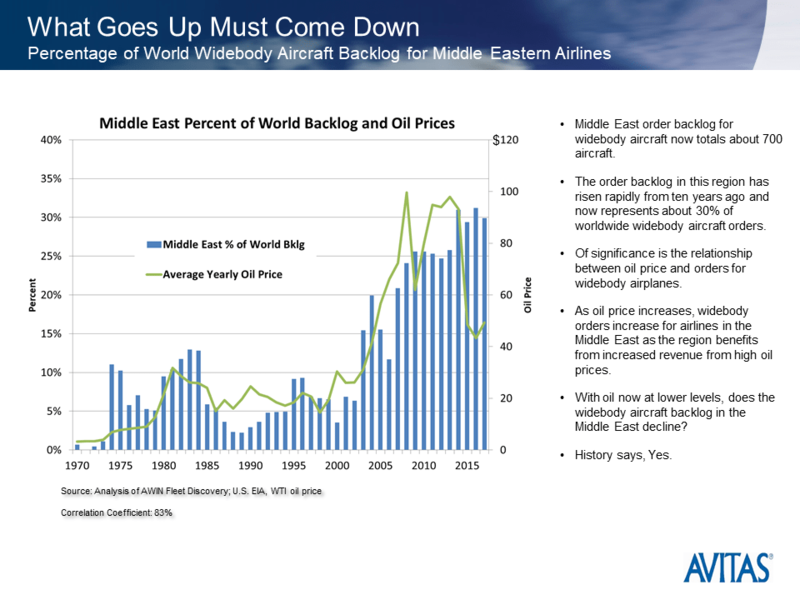 With oil now at lower levels, does the widebody aircraft backlog in the Middle East decline?